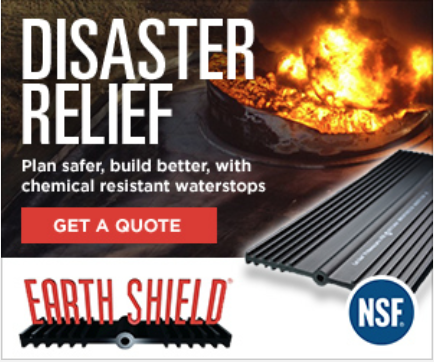 Earth Shield Type 20 & Type 23 Hydrophilic Butyl Rubber Waterstops are designed to swell when exposed to water, yet maintain a solid structural integrity that will not deteriorate due to uncontrolled expansion, unlike many of the traditional, clay-based waterstops currently on the market. This swelling ability prevents the passage of water through concrete construction joints. Type 20 & 23 waterstops are fast, easy, and economical to install. Simply apply Earth Shield Primer to the existing concrete, firmly press the waterstop to the primed surface, and place your second pour of concrete. No splitting of forms or difficult field welding is necessary to achieve a watertight seal. Earth Shield Type 20 & 23 waterstops are designed for non-moving construction joints only. 2" minimum of concrete coverage is required on all sides of waterstop. Type 20 & 23 waterstop should be installed with Earth Shield Primer (available separately). Consult with Earth Shield Technical Sales for more information. CAD details,installation guidelines, and 3-part specifications are available.